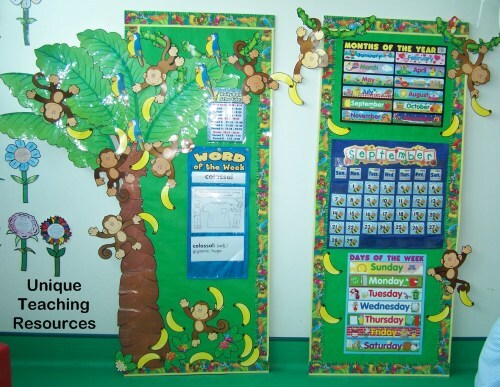 The saying "A picture paints a thousand words" is especially true of classroom bulletin board displays and fun projects for our students to complete. 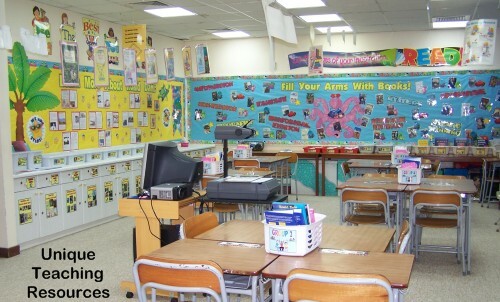 As teachers, we can get a lot of ideas and inspiration just from seeing a photograph from another teacher's classroom. 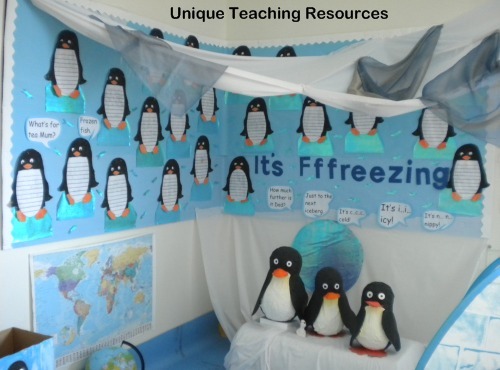 This page contains ideas and examples for some of the displays that I have created in my different classrooms. The majority of these photographs were taken before I started Unique Teaching Resources and are not related to a particular set of lesson plans available on my website. If I have lesson plans related to a particular photograph that you see on this page, I will include a link that will take you to a page where can view this information. This page of Unique Teaching Resources is a "work in progress" and I will be adding more photographs during the year. 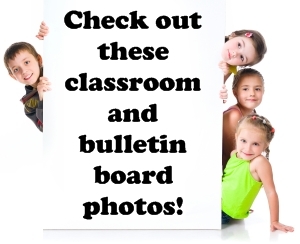 Please check back on this classroom bulletin board displays page from time to time to see the new photographs that I have added. On the first day of school, I have no student projects to showcase on my bulletin boards. 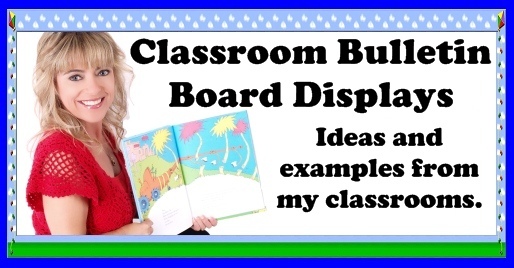 I do not like to have students walking into their new classroom and see empty display areas, so I always create classroom bulletin board displays that feature what we will be learning about during the first month of school. During the first month of school, my students complete an author study about Roald Dahl, so I created a bulletin board display (shown on the left) that highlights Roald Dahl and his novels. During the first part of the school year, my students will "Dive Into Reading" a wide variety of different genres of literature. I designed an octopus that has its arms filled with books and an ocean themed bulletin board display. I surrounded the octopus with titles of the genres that my students will be reading: fantasy, mystery, adventure, science fiction, realistic fiction, historical fiction, biography, and nonfiction (these large titles are hard to see in this photograph). Dive Into Reading Sticker Charts: These fish shaped sticker charts are divided into eight genres: fantasy, mystery, adventure, science fiction, realistic fiction, historical fiction, nonfiction biography, nonfiction information, and a free choice selection. T - ry your best! 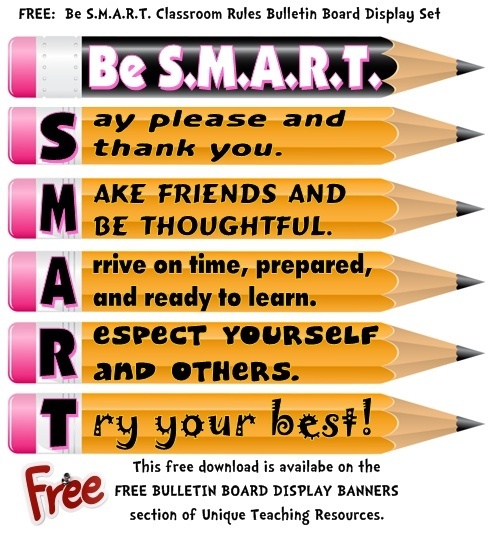 You can find the free download link for this free "Be S.M.A.R.T." My students complete a lot of unique book report projects that I have designed throughout the school year. For their last book report activity in June, students design their own projects. 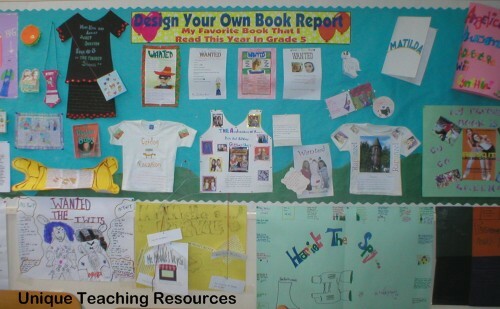 Below is a classroom bulletin board display featuring my students' reading projects. 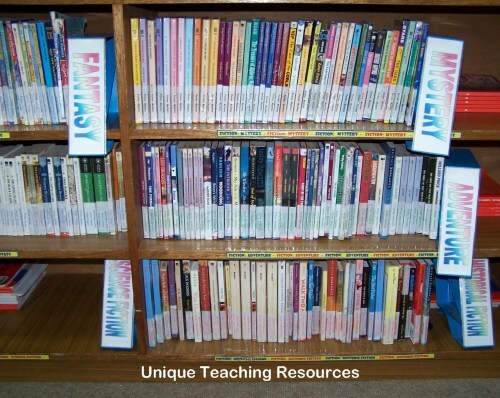 Book Report Templates: You will find ideas for over 20 different book report projects on this page of Unique Teaching Resources. At the end of the school year, we have a Reading Celebration Day. My students enjoy dressing up as their favorite characters from the books that they have read that year. On this day, my students give speeches pretending to be the characters that they chose. For part of their character speeches, my students present "1st Place Book Awards" to their favorite books and they complete a project shaped like a trophy for this assignment (shown below). 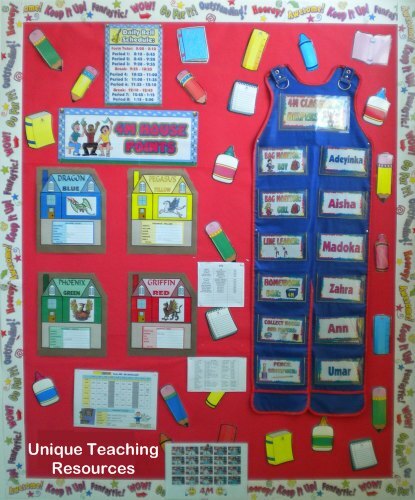 Pockets charts are ideal for displaying sentence strips. 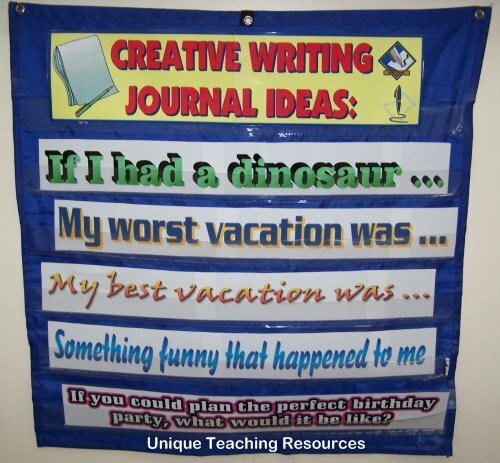 This pocket chart display contains writing prompts and journal writing topics. I change these sentence strips once a week. Creative Writing Templates: Fun writing projects in a variety of unique shapes. Poetry Lesson Plans: Templates and projects that will engage your students in writing poems. 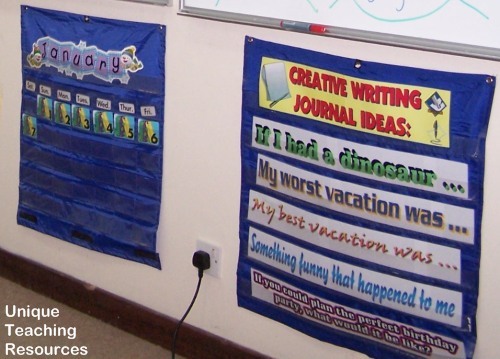 Below: I display my classroom calendar pocket chart next to my creative writing prompts pocket chart in my classroom. I like using a pocket chart for calendar sets because you don't have to worry about staples, thumb tacks, or velcro and the pieces do not get damaged inside the pocket chart. It is also quick and easy to change my calendar pocket chart at the beginning of each month. Below: This is a photograph from a different school that I worked at. This is the same pocket chart shown above and I probably used it for at least 10 years before having to replace it with a new one. 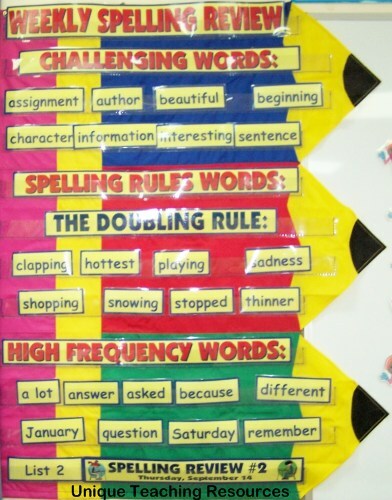 In this classroom display, I also am using a pocket chart for our "word of the day" display. I label all of the spines of the books in my classroom library so that it is easy for students to find the correct place in my library where the book belongs. Genre Pizza Reading Sticker Charts: These unique pizza charts encourage students to read 8 different genres of literature: fantasy, adventure, science fiction, realistic fiction, mystery, non-fiction, biography, and a free choice book. Dive Into Reading Sticker Charts: These fish shaped sticker charts are divided into eight genres: fantasy, mystery, adventure, science fiction, realistic fiction, historical fiction, nonfiction biography, nonfiction information, and a free choice selection..
Below: In addition to separating my classroom library into genres, I have colorful boxes labeled with the names of some of my students' favorite authors. If a student has really enjoyed a story written by a particular author, they are usually always enthusiastic to read another book by the same author. 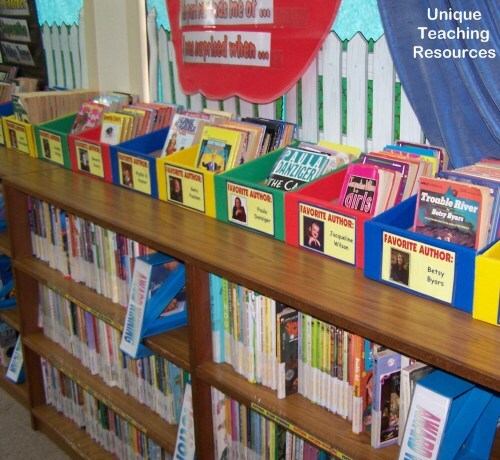 Dividing a section of my library into "favorite author boxes" helps students to find these books quickly. Below: My students love reading biographies about famous people. Although they may learn more about history if they read a biography about George Washington (and I do have these types of reading assignments during the school year), I have found that during their free time, my students love reading about the lives of people that they know about from TV, movies, music, sports, and famous authors. 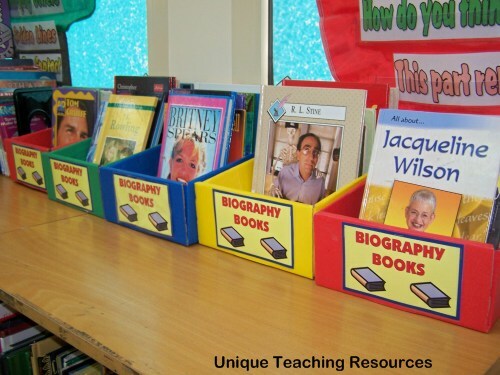 I created these biography boxes in my classroom library so that students can quickly find a book about a famous person that interests them to read. 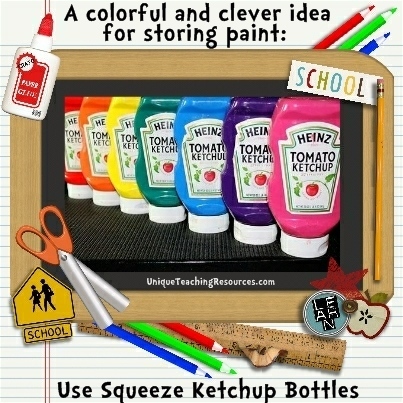 Unique Book Report Projects That Your Students Will Love! Biography Book Report Newspapers: Your students will enjoy creating these extra large newspaper book report projects. They will have fun being newspaper editors and writing articles, cartoons, and timelines based on the famous people that they have read about in their books. Character Body Book Report Projects: After reading a biography, your students will love designing large character body projects about the famous people that they read about. Movie Camera Book Report Projects: Your students will enjoy being movie directors and shouting "ACTION!" as they direct films about the famous people that they read about. They will have fun choosing set locations, costumes, props, and actors for their biography movies. 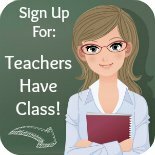 Spelling Teaching Resources: Free spelling lists and flashcards. Fry 1000 Instant Words: Free words lists and flashcards for Fry's sight words. Dolch Sight Words: Free words lists and flashcards for Fry's sight words. My students record their own behavior problems for three categories using Post-It Notes. 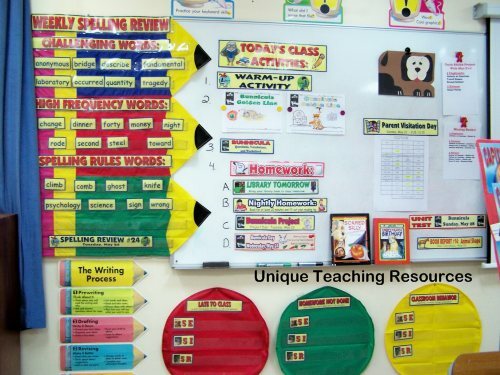 They place their "behavior notes" in the corresponding pocket chart circles (red, green, or yellow) shown in the above photograph. 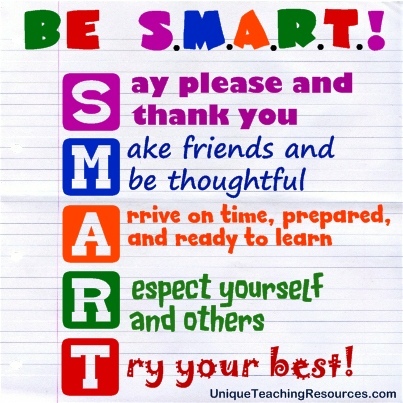 Red - Late to Class: This particular behavior management program was for Grade 5 students. At our school, fifth grade students walked to and from the cafeteria on their own and they also went out for recess on their own. If a student returned late from either lunch or recess, he/she went and got a Post It Note and recorded being late on the note and placed it in the red pocket chart. Green - Homework Not Done: As I was collecting homework assignments, if a student did not compete that assignment, he/she would go and get a Post It Note and record this on the note and place it in the green pocket chart. First Warning: During class, if a student was misbehaving, I would not stop my lesson or the activity that we were doing at the time to address this problem. I would simply walk over to the student and place a Post It Note on the edge of the student's desk. The student knew that was my warning signal that I was not happy with what he/she was doing at the time. This "silent warning" would almost always cause that behavior to stop. My students evaluate their effort and classroom behavior at the end of each week and prior to progress reports and report cards. End of Week: At the end of each week, my students were given all of their "Behavior Post It Notes" and they glued them on their "Classroom Behavior Worksheets." This was my way of having students keep a weekly record of their own behavior. These "Classroom Behavior Worksheets" were useful at parent conferences because if I had behavior concerns to discuss with a parent, these problems were written in the student's own handwriting on notes, which were glued on their child's personal behavior chart. End of Term: For most schools, teachers are required to give a citizenship or effort grade on report cards and progress reports. 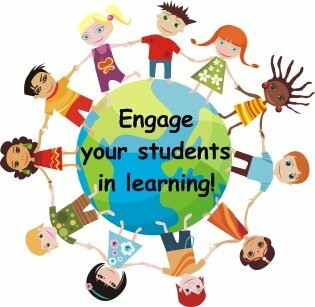 Prior to completing my report card evaluations, I had a conference with each of my students. We used their "Classroom Behavior Worksheets" to discuss what mark they felt they deserved for citizenship/effort based on their charts. My students knew ahead of time the citizenship and effort grades that would be on their report cards because they were included in the evaluation and decision making process. I assigned 6 different students to be my classroom helpers each week. I used an overall pocket chart to display this information. By using a pocket chart to hold the names of my student helpers, I was able to quickly change the names at the beginning of each week. I love pocket charts that are in different shapes and colors! 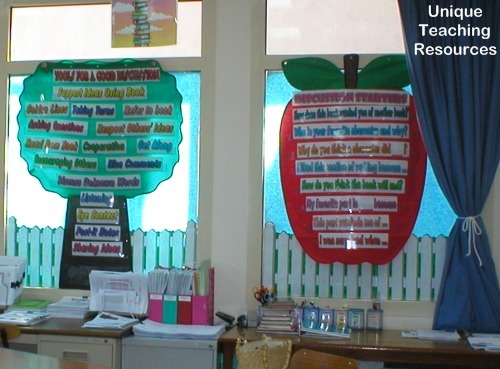 These apple and tree pocket charts have been used time and again in my classrooms during my teaching career. In the photograph below, these pocket charts are being used to display sentence strips about "Tools For a Good Discussion" and "Discussion Starters." We were completing a literature study about Roald Dahl at the time and my students often met in literature circle groups during this unit of study. Thank you for visiting my Classroom Bulletin Board Displays page.